After you buy the plugin, you should receive an email receipt from Nose Graze. This email will contain a link to download a .zip file containing the plugin. Once you have the zubb-reading-challenges.zip file downloaded, login to your WordPress site. Navigate to Plugins » Add New and click on Upload. Select the .zip file from the upload link and press "Install Now". Once it installs, click "Activate" and then you're done. If you wish to enable automatic updates, you need to enter your license key. To do this, navigate to Ultimate BB » License. You'll see a new box there specifically for the Reading Challenge License. Enter your key there and press "Save Changes". When the page reloads, you will need to click the Activate button below your license key. The key will not be activated until you click that button! 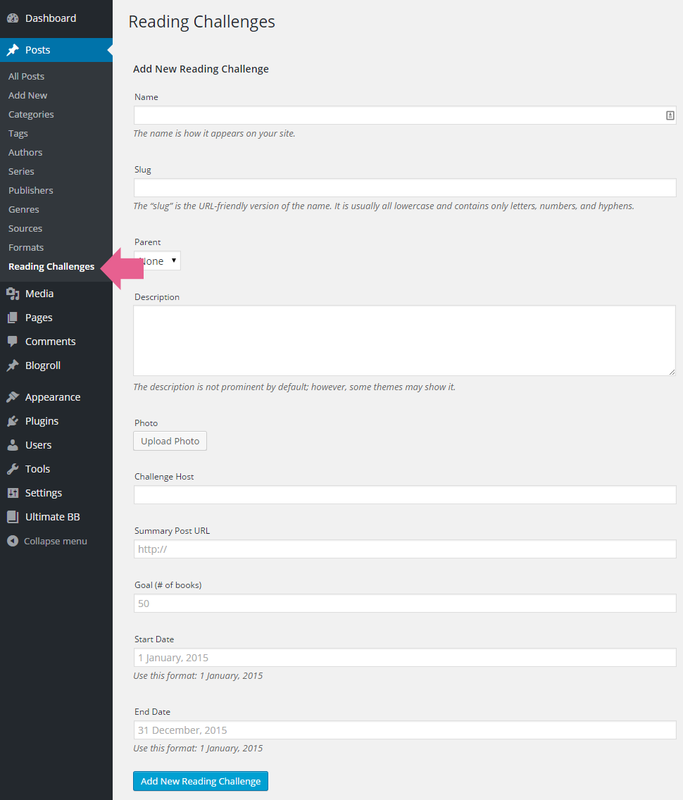 The settings for the reading challenge add-on are located in Ultimate BB » Add-Ons in the "Reading Challenges" section. 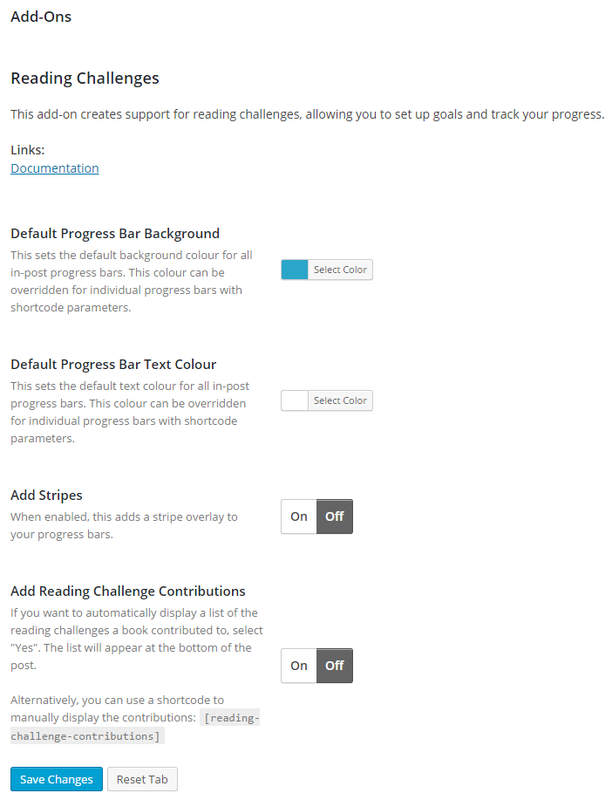 This is where you can set the default colour scheme for your progress bars, and opt to display the reading challenge contributions or not. Once you install the plugin, you'll have a new section in your posts menu called Reading Challenges. 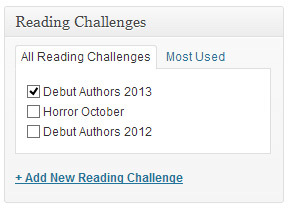 Click that (Posts » Reading Challenges) and start adding some of your challenges! You can title it, upload a photo, specify a challenge host, enter in the URL for your post summary, set a goal, and specify start/end dates. When you've saved your challenges, you can then assign posts to them. Each time you review a book that counts towards a challenge, you'll want to select that challenge on the post edit screen. The box will look similar to categories, but it's specifically for challenges. As you add posts to challenges, the plugin will keep monitoring your progress, which can be displayed through a series of shortcodes. The [challenge-progress] shortcode displays a progress bar for a given challenge. for - (required) - The name of the challenge this progress book is for. This name needs to be exactly the same as what's entered in Posts > Reading Challenges. bg - Background colour of the progress bar. If omitted, the default (specified in the settings panel) is used. font - Font colour. If omitted, the default (specified in the settings panel) is used. title - yes | no - Whether or not you want to show the title of the challenge, followed by your current progress. for - Name of the challenge to display the overview for. If omitted, overviews are shown for all challenges. bars - yes | no - Whether or not to show progress bars. Defaults to 'yes'. showempty - yes | no - Whether or not to show challenges with zero books. Defaults to 'no'. showended - yes | no - Whether or not to show challenges that have already ended. Omit for 'no' (default). The [challenge-books] shortcode displays a list of all books that are associated with a given challenge (or all challenges). for - Name of the challenge to display books for. If omitted, books are displayed for all challenges. overview - yes | no - Whether or not to also display the overview (see the [challenge-overview] shortcode). Defaults to 'no'. stars - yes | no - Whether or not to display your star rating for each book. Defaults to 'no'. The [reading-challenge-contributions] shortcode displays a list of reading challenges the current post contributed towards.